What happens at a dental check up? Going to the dentist when your tooth starts to ache is not the way to care for your teeth. What happens at a dental checkup paves the way for corrective measures that will ensure your teeth last for a long time. When you go for a dental checkup, the dentist will evaluate if you need fillings, a brace, or a tooth restoration. The dentist will also check for gum disease and bite or jaw problems. Sometimes, all you’ll need is a prophylaxis if you’ve been going to your dentist on regular basis. If not, the dentist may want to take X-rays to see behind the gums as cavities may have rotted your teeth beyond repair. The dentist should also talk to you about your current health. This will help him or her determine if any conditions or medications are contributing to the degradation of your dental health. For example, diabetes is a known contributor to gum disease. And certain medications induce a dry mouth – which leads to tooth decay. 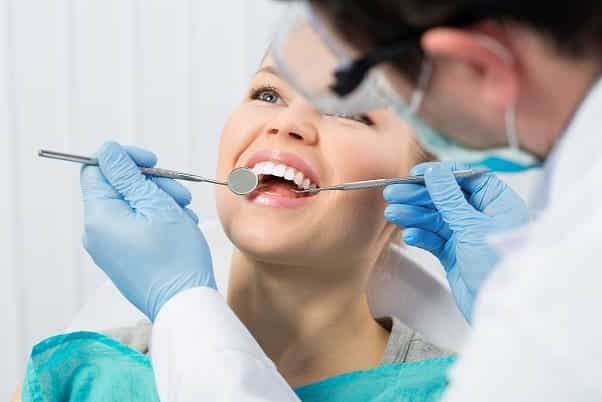 Apart from that, the dentist may also discuss with you lifestyle and diet choices which lead to poor dental health, as well as techniques to better clean your teeth and oral cavity. The recommended interval for dental checkups is every 6 months. The intervals may be modified by your dentist, depending on the condition of your gums and teeth. If you haven’t gone to a dentist in a long time, chances are you have incipient tooth decay in one or more teeth at the very least. Cavities may already be present but not felt as the rot may not have reached the nerve endings yet. It’s likely that the dentist will recommend an oral prophylaxis to clean your teeth and gums. If you’ve had extractions before, the dentist will also check if your teeth have not become crooked or misaligned. When you have empty sockets in your gums, the pressure of chewing and biting down causes the teeth to exert pressure on the gums. These eventually cause misalignment if you don’t replace the extracted teeth. As you see, having a dental checkup in Surrey is not just an excuse for giving a dentist money. There are many conditions that can be detected that have a bearing on not just you teeth, but also your general health.